← Truth to power, baby! 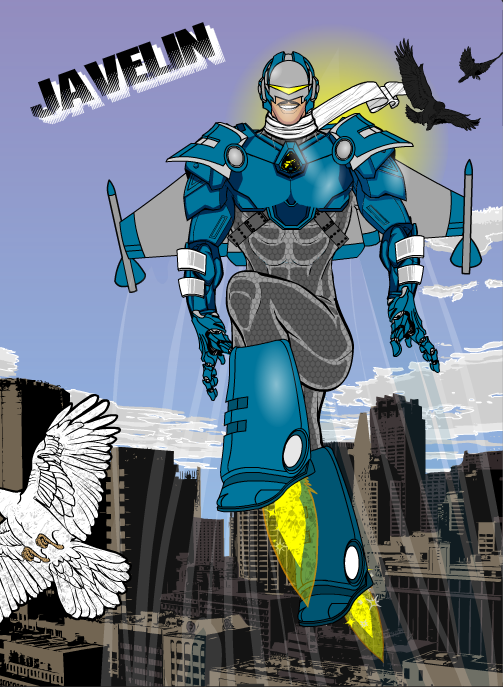 Many thanks to author Ian T. Healy for putting together the "Just Cause" contest. Here is his write-up of his choices. First of all, the entries. Note: Djuby entered several times, more than permitted by the contest rules, in fact, so I’m only going to count two of his entries of Desert Eagle—one from Graceful Blur and one from Just Cause since she appears in both works. I will share all of them with you, though. I’m counting #2 as his entry for Graceful Blur and #5 as his entry for Just Cause. 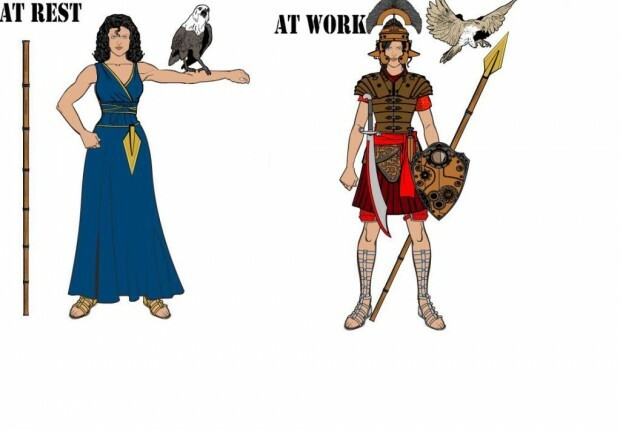 I like the fact that he made her muscular, because I describe her as such in the books. I also like the neck decoration. 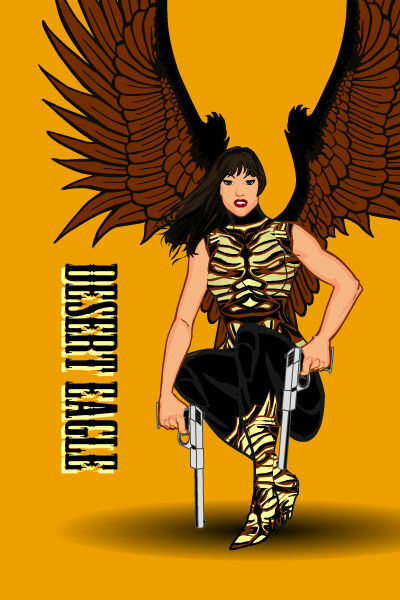 Djuby’s second Desert Eagle has a lot going for her. I really like her wings, face, hair, and that amazing skirt. I can’t imagine trying to fly in that outfit, though. I’d think poor Sondra would fly herself right out of it. 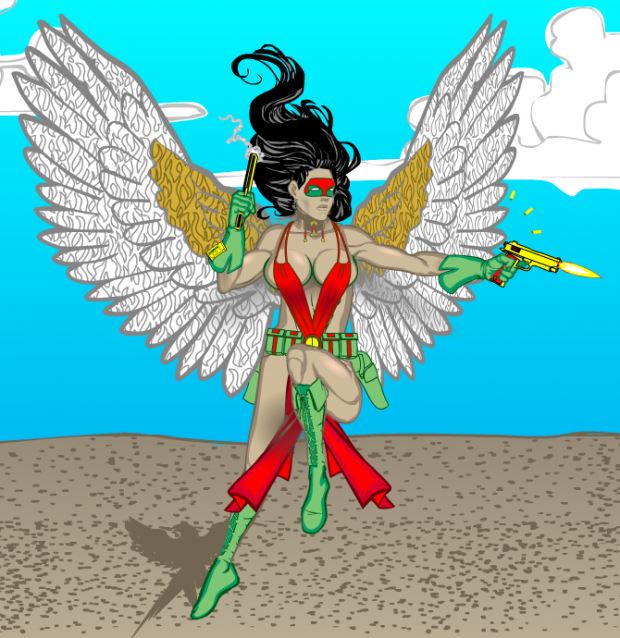 Djuby’s third Desert Eagle has some crazy detailing going on in the boots and legs. Those wings look ouchie. 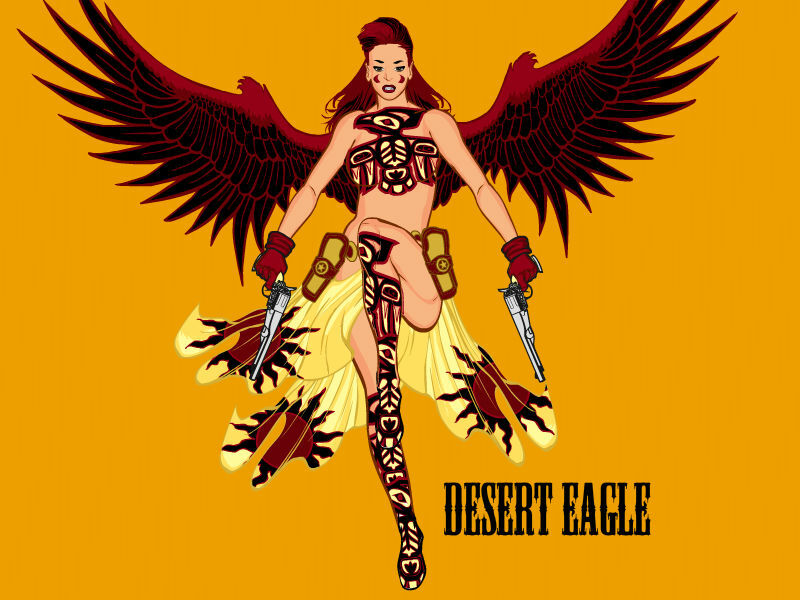 I like a lot of aspects of Djuby’s fourth Desert Eagle. The wings are full and rich, and the outfit is practical and very pretty to look at (with lots of what Zander Cannon calls line mileage). 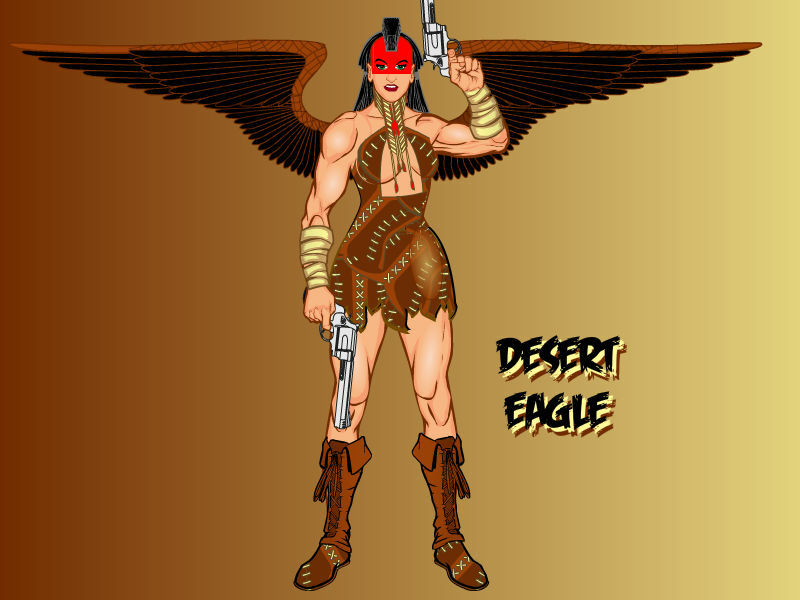 Djuby’s last Desert Eagle is probably my favorite of his bunch, between the pose and the outfit and the face that manages to look more like a Native American than most. 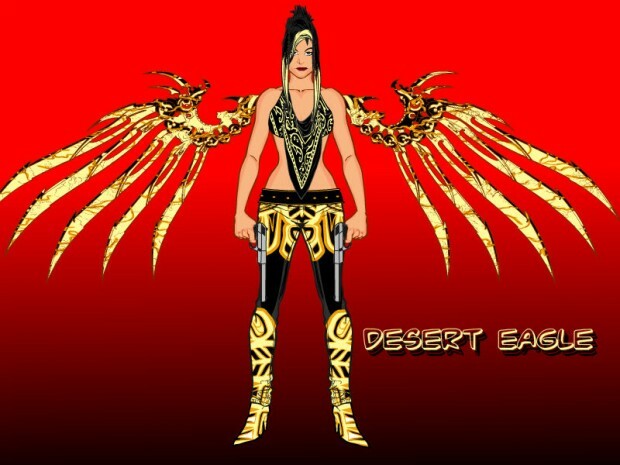 I like the pose and hair and wings of Skybandit’s Desert Eagle, but I must say that’s a pretty impractical outfit, especially for a flyer. Nevertheless, nice job! Ariana’s Desert Eagle makes me think of Michelle Rodriguez, and that’s always a good thing in my mind. I like the costume details and the tattoo, and her face is really astonishing to me. Jack made John Q. Public from TsoRP and even though his face is wrapped up a la Darkman, there’s something about the pose and the outfit that I appreciate. Jack’s second entry was Doublecharge and wow, I really liked this picture. It’s not really representative of how I describe her, but I really like the simple, yet elegant design. 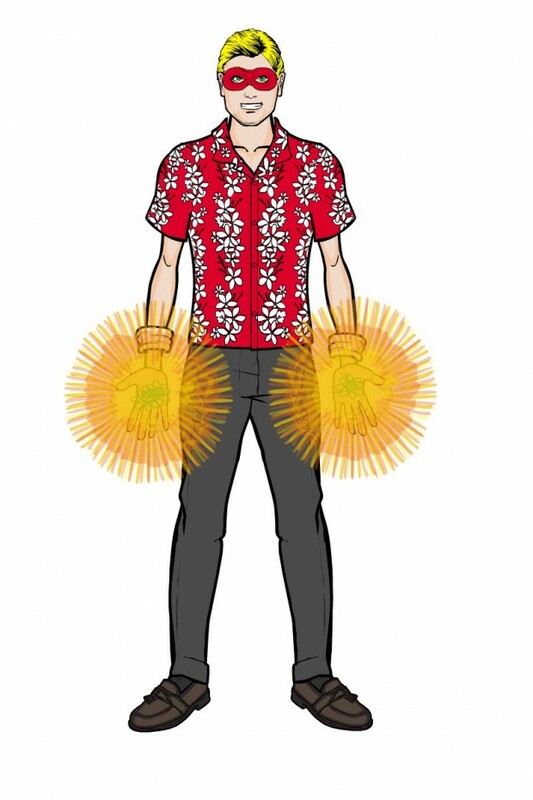 This outfit looks reasonably practical for a real-world usage, which is an aspect I’ve tried to feature in the Just Cause Universe stories. Herr D’s Doublecharge was creative and whimsical, but I wish he’d let me actually see what she looked like. 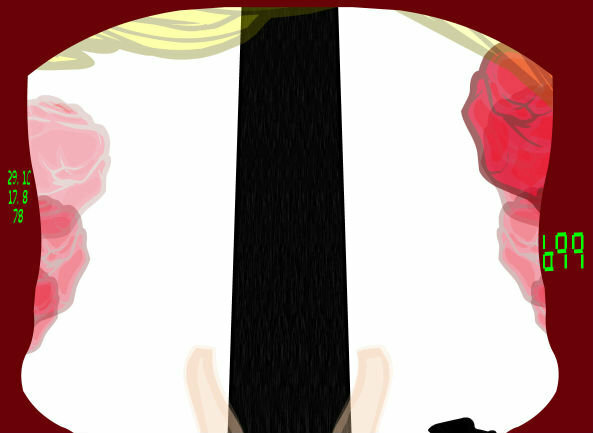 Herr D did something I’ve never seen in HeroMachine images before—he made a picture from Mustang Sally’s POV inside her helmet. Kudos to him for thinking so far outside the box. 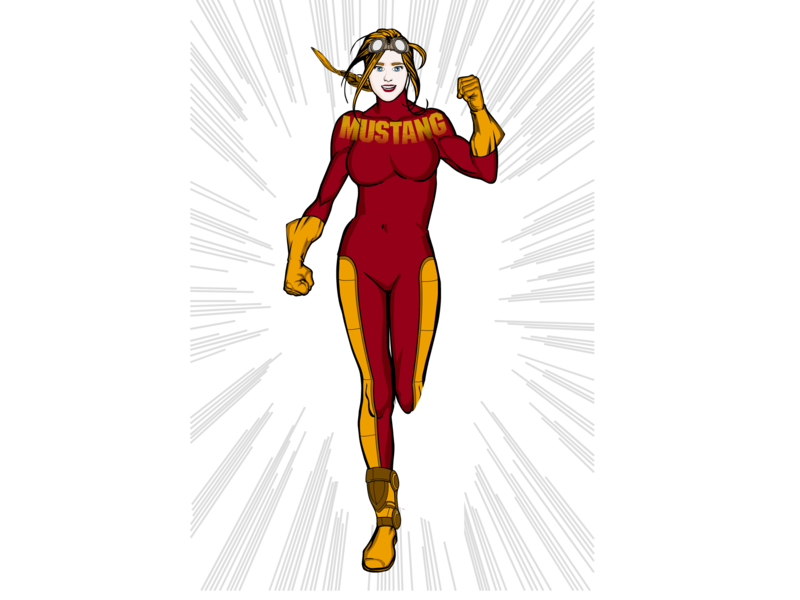 Watson’s Mustang Sally has what looks to me like a very practical superhero outfit that doesn’t require lots of double-sided tape and careful posing. Overall, a very nice design. 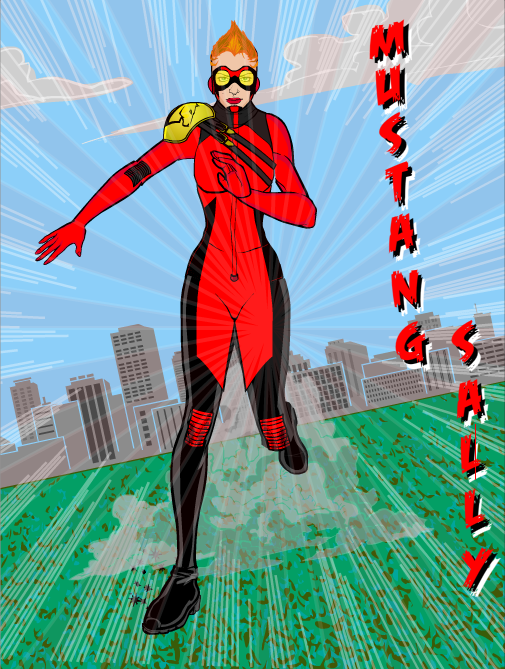 Marquis Samedi’s Mustang Sally was a very interesting take on the character. 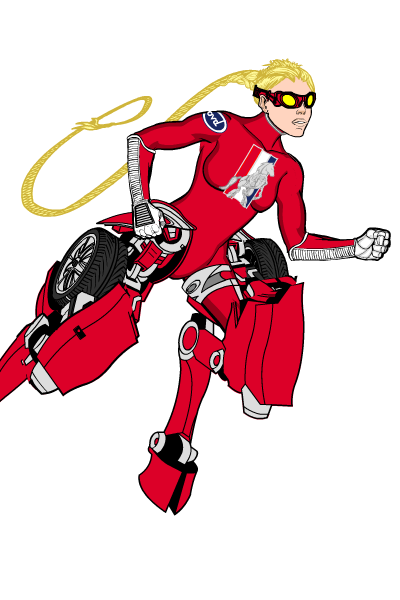 I liked the sponsor logos and the goggles, but I have to admit the transformer legs kind of threw me for a loop. Ariana captured a lot of what I would call the essence of Mustang Sally here. 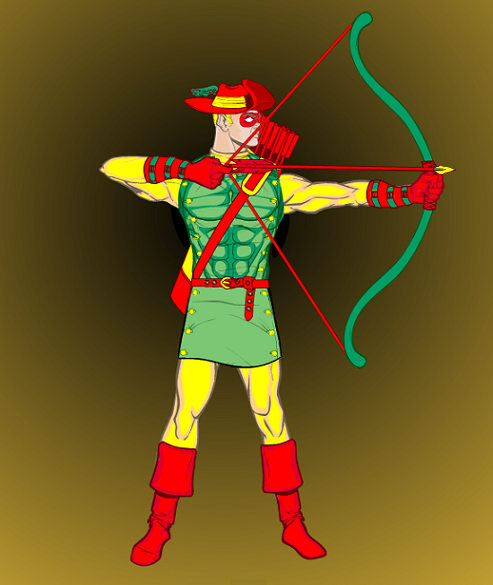 The red and yellow costume, the boots with the bracing, and the youthful face. She’s built a little more solidly than Sally, but then, maybe this is Sally several years after the events of Just Cause, because we all know what happens when we hit 30. Or, in my case, 40. 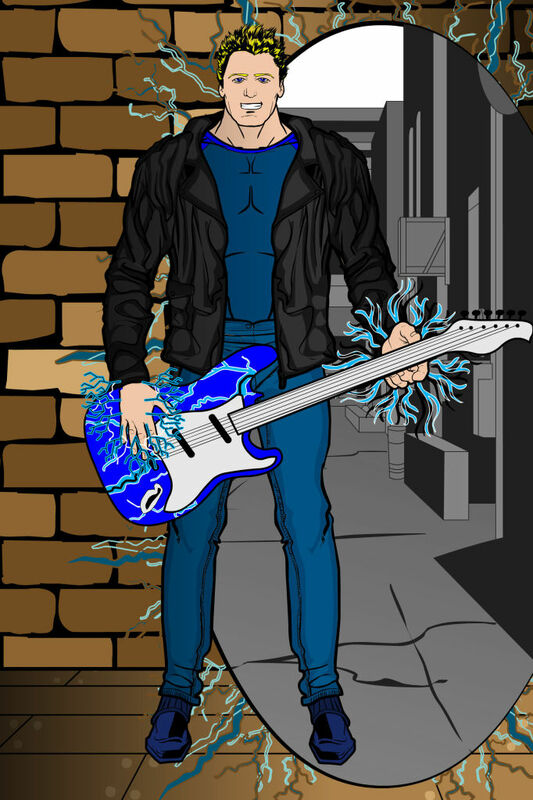 Stratocaster was a favorite character for a lot of people. Sebastian978 made him the fifth member of KISS. I like the tattoos and the detail work on the torso. 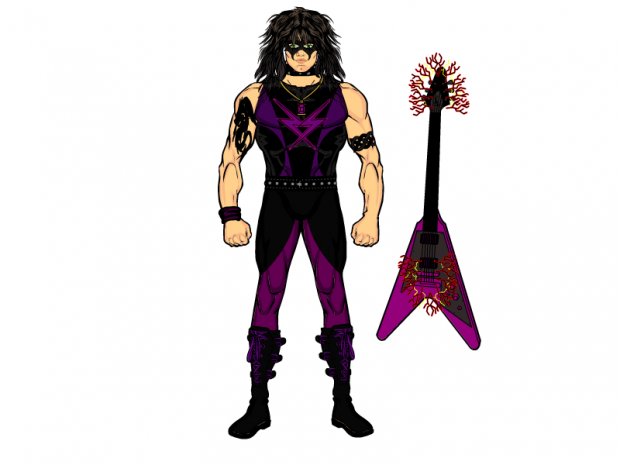 Juggernaut’s Stratocaster is less ‘70s and more modern in his appearance, with the short hair, t-shirt, and leather jacket. I’m a fan of the face, because not enough people use that particular mouth and it’s one of my favorites. 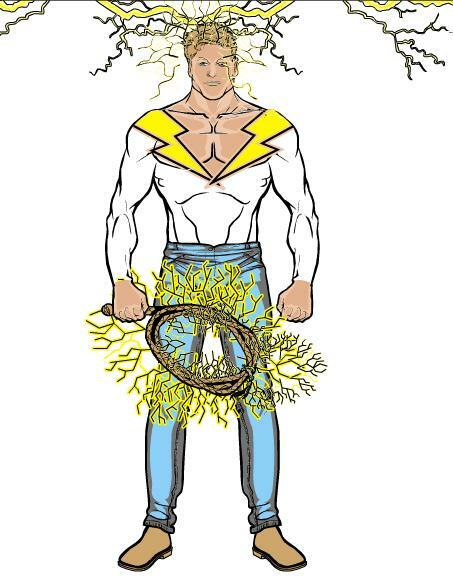 I even used it in the Local Hero Press logo. 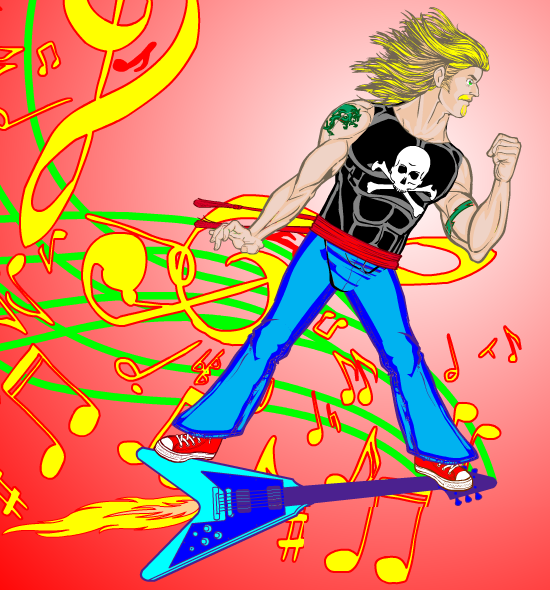 Skybandit’s Stratocaster is a lot of fun. Great background and a whimsical pose. He’s right out of a psychedelic Woodstock-era band in this picture. Not canon, but definitely a fun interpretation. Ariana’s Lady Athena was really amazing to me. 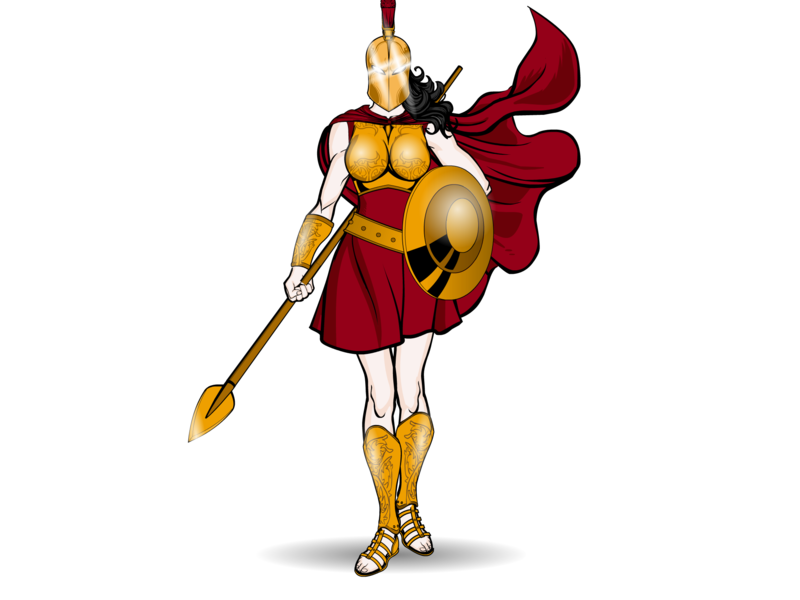 The blowing cape, the helmet, and the armor really captured the essentials of the character. 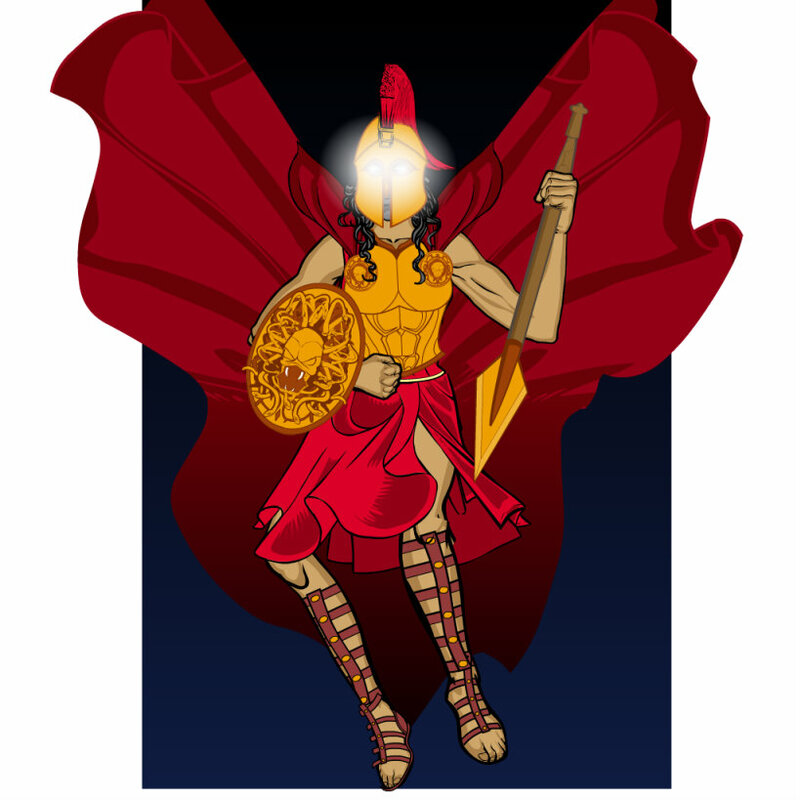 Marquis Samedi’s Lady Athena was incredibly dramatic and an excellent vision of the character. She looks imposing and powerful and heroic. 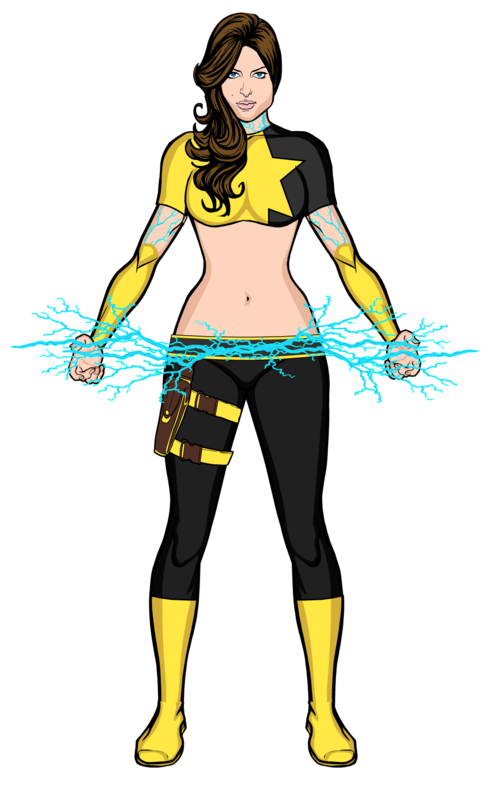 Keric’s Spark looks like a great mix of practicality and superhero-ey cheese. I could totally see this character in a modern-day comic book. Keric’s Lionheart surprised me. He looked very period-correct, and I really liked the way his mane turned out. Plus, he has a tail, which made me laugh. 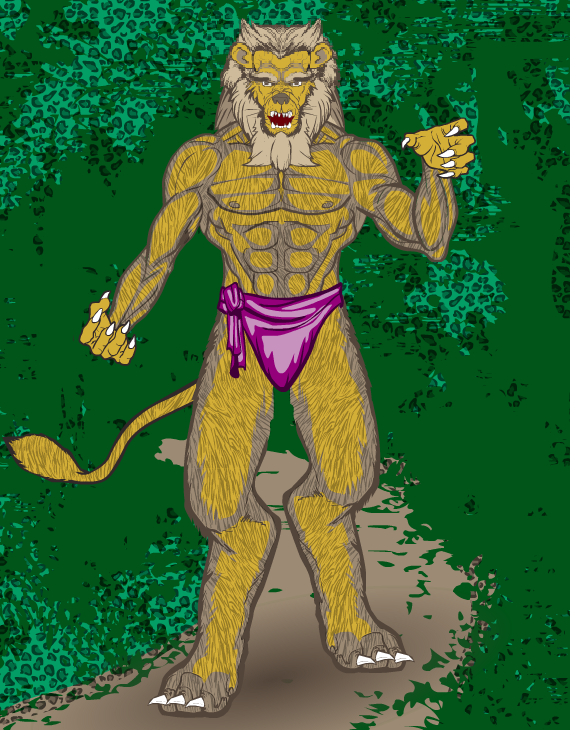 Skybandit’s Lionheart is far more animalistic than I’ve thought of him, but if I met this guy in a dark alley at night, I’d probably give him all my money whether or not he asked nicely. Ariana’s Lionheart is another excellent period piece. He looks like he stepped right out of a baaadaaassss blaxploitation superhero film. 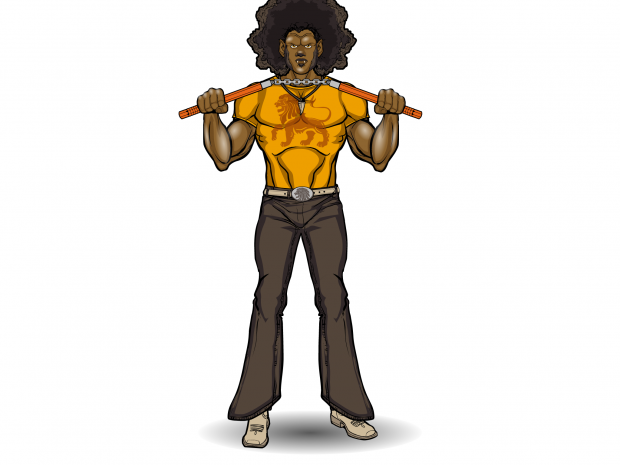 The bell-bottoms, the nunchuks, and the pendant really nailed the ‘70s feel. 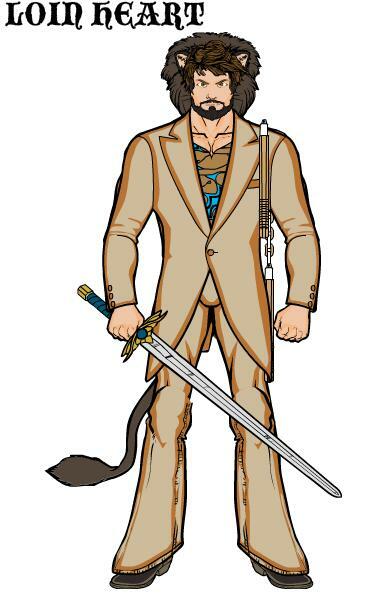 For admitting that the ‘70s fashion thing was confusing, YouAlreadyKnowIthink made a very good Lionheart. 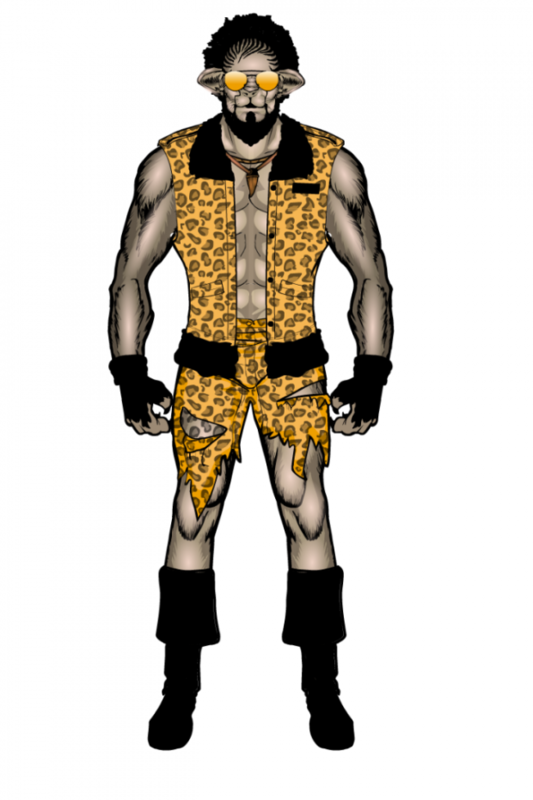 The leopard-print outfit is wonderfully tasteless and the afro is a great touch. Watson’s Flashpoint was a great homage to pulp action figures. 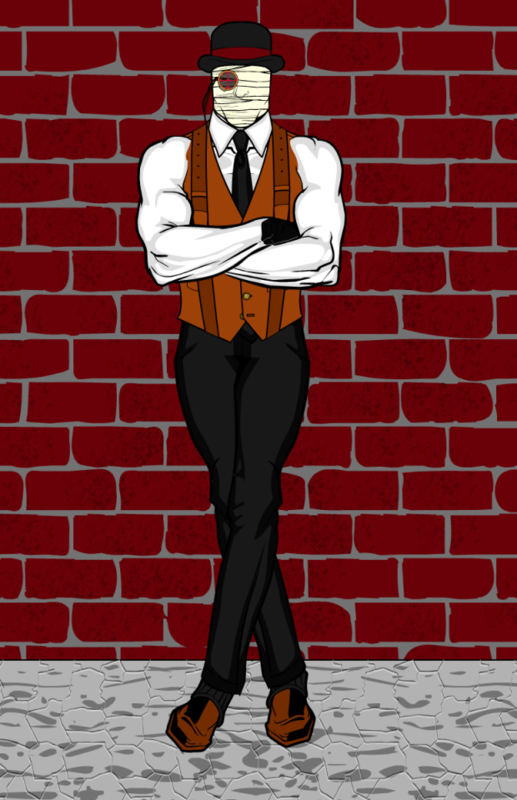 Although this is more of a ‘30s type of outfit and TsoRP is set in the 1948, I could see the character dressing this way. Watson’s Javelin was a fantastic piece of work. I loved the detail of the armor that still managed to feel period-correct with the big clunky bell-bottom rocket boots. He also managed to include a mustache, which no ‘70s Puerto Rican hunk would be without. 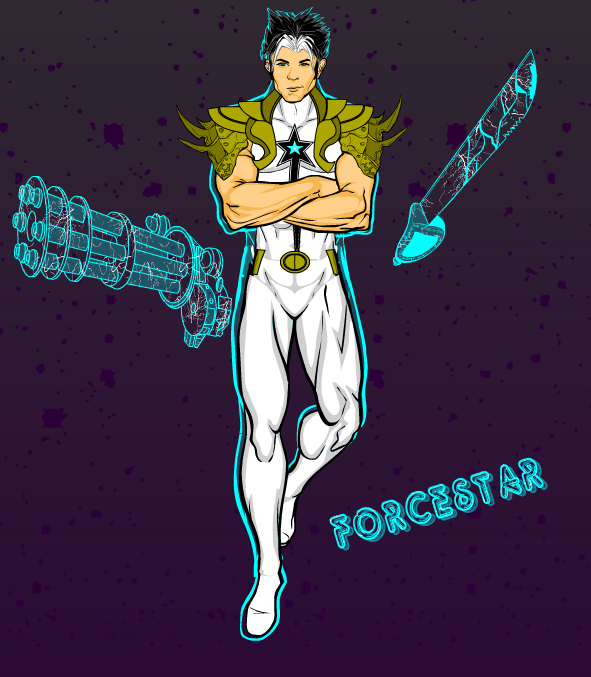 This was a fun interpretation of Forcestar from Watson, who created a great face and pose here. I like the detailing of the created items and the halo around the character as well. It was nice to see Herr D’s creative take on Juliet. She has always been one of the undersung characters of the Lucky Seven. All I can say here, Marquis Samedi, is wow. Just...wow. Do you need a hug? Skybandit’s Dr. Danger is very appropriately Golden-Age in his color scheme and appearance, and the pose is wonderful. I could see him leaping right off the page of a four-color pulp from that era. 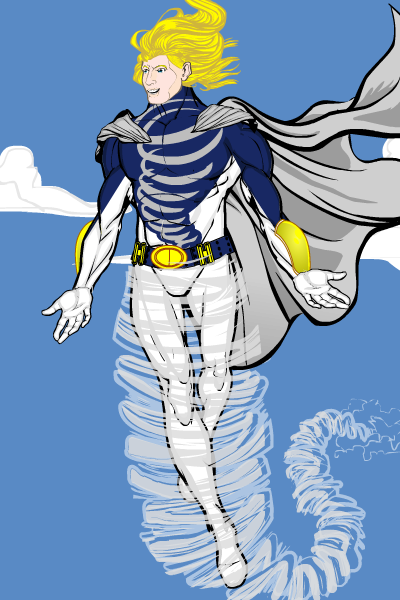 Marquis Samedi’s Tornado is a great interpretation, with a bright, heroic color scheme that fits well with the character in The Steel Soldier’s Gambit. 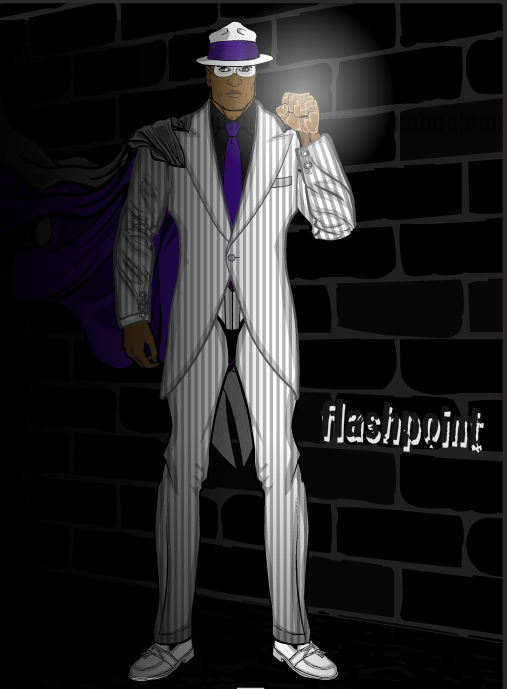 The flowing hair and cape is a must for the character, and he captured them well here. This Kid Crash from Starfighterace421 looks like he stepped right out of an Elvis movie from the ‘50s. 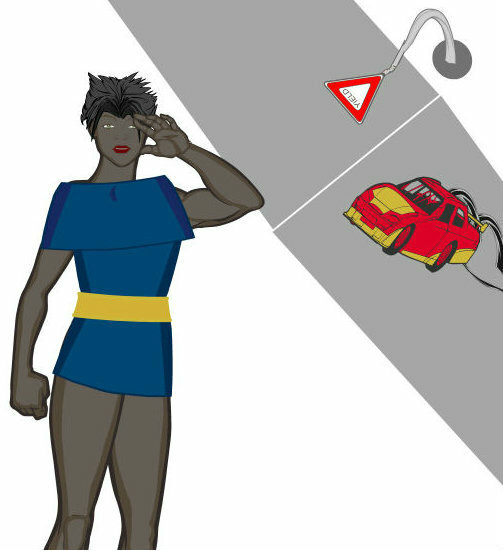 It’s a practical outfit, if not very “super,” but I love the face. Rhinoman also entered a Kid Crash, but there was a problem with the image and Photobucket wouldn’t display it. For not having read the books at all (and shame on you for that! 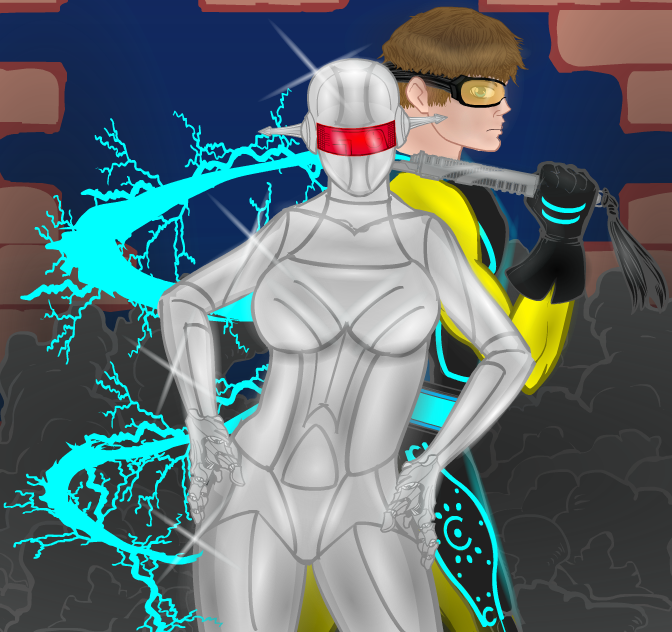 *angryface*), Harlequin made a very nice picture of two members of the Lucky Seven, and I think he did a good job with them both. The best interpretation of a character as I imagined him/her goes to Marquis Samedi for the outstanding Lady Athena. 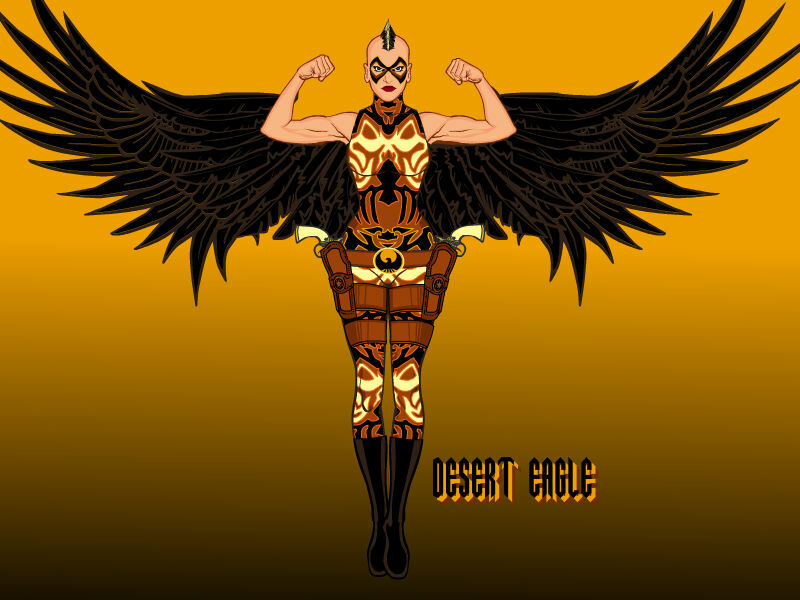 The best original interpretation of a character goes to Djuby for the Desert Eagle #2. Congratulations, Marquis Samedi and Djuby. You each win a signed digital ARC of The Archmage. I can provide it formatted for any ebook reader or as a pdf. Please email me at ian AT ianthealy DOT com with your preference. And my favorite overall character design goes to Ariana Iris for the Mustang Sally. Congratulations, Ariana Iris, you win a signed print ARC of The Archmage and a digital copy. Please email me at ian AT ianthealy DOT com with your mailing address and your file format preference. Thanks again for all your entries, everyone! I hope you had fun and I hope you’ll check out the stories of the Just Cause Universe as well as my other works. Just search for “Ian Thomas Healy” to find them. And thanks to Jeff for hosting my contest! So close!!! maybe next time eh. Thank you, Mr. Healy for your positive feedback. (and Jeff for hosting the contest! which goes without saying, So I won’t.) I am kind of shocked by which characters had only a single entry. Like spark and Juliet! Even seeing some of the other entries, I don’t think I would change any thing. great contest. I had a lot of fun on it, hope to see more heromachine/creator owned property mash ups. The 5th member of KISS lol, not what I was going for but seeing the’re one of my favorite bands I’ll say thanks 🙂 And thank you Jeff for explaining to me how to do the tattoo’s. Speaking of following directions, David…I need you to contact me via email so I can send your prize. Thanks. Congrats to the winners. Harlequin? Loved your Carousel. Is she in ‘flirt mode?’ Ian, thank you for the critiques. Umm? 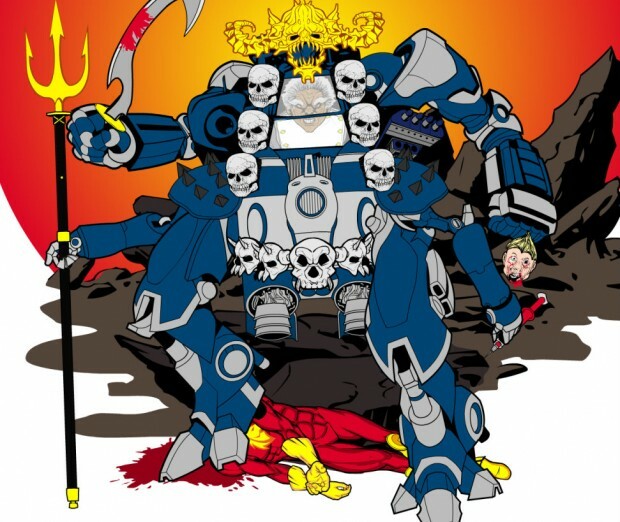 Will we have your permission to post these in hm forums even though they are copyrighted characters? Wow, that was a surprise! Thank you very much, I appreciate it. Congratulations to the other participants, great characters though. You may post them, but please include the following tag on any post of a Just Cause Universe character: [character name] copyright to Ian Thomas Healy, posted with permission.